The bee has been observed collecting dandelion (Taraxacum species) pollen (pers. obs. ), but other flowers are doubtless utilised. Polylectic in Germany, foraging from species in the families Apiaceae, Asteraceae, Brassicaceae, Caryophyllaceae, Cornaceae, Ranunculaceae, Rosaceae and Salicaceae (Westrich 1989). Nesting habits are apparently largely unknown. In Germany, the species is stated to be "solitary" (i.e. non-social) (Westrich 1989). This small Nomada was only recognised as British in 1944 (Spooner 1946) but had been found much earlier, in 1878, by C.W. Dale, although he failed to recognise the species. It is one of our most localised bee species, but has not been seen since 1982, despite several recent searches. Restricted to a small area of coast on the Isle of Purbeck, Dorset. Widespread in southern Europe, but nowhere frequent. The known area is limestone grassland with local areas of open clay soil where the host bee, Andrena nitidiuscula, nests. The species has been found at wild carrot (Daucus carota), ragwort (Senecio sp.) and yarrow (Achillea sp.). It has also been found on Wild parsnip (Pastinaca sativa) in Germany (Westrich, 1989). A Nomada species with a tricoloured gaster and reddish hair on the thorax (more evident in the female) in Britain and Ireland is likely to be this species. Identification keys and general biology are given in Perkins (1919), Gauld and Bolton (1988), Michener (2000) and Else (in prep.). East Cornwall to east Kent, north to Durham (Shotley Bridge). There are old records from Guernsey. Not recorded in Scotland and Ireland although its host is present in these countries. Seems to be decreasing in central and southern England and mainly concentrated in northern and western England. Overseas the range extends from southern Fennoscandia southwards in Europe and east to Siberia. Listed as RDB3 (Rare) in Shirt (1987) and by Falk (1991). Recent data indicate that the status of this species could be downgraded. Found in open sunny areas within the nesting sites of the host. Where the host is nesting in large compact aggregations Nomada males and females can be very numerous. Usually univoltine. In northern England males fly from April until June but mainly during May, and females from April until July but mainly during May and June. These flight periods coincide, not surprisingly, with those of its host, Andrena cineraria. The rare records of females during August may represent a second brood. Fewer records are available from southern England but both males and females fly mainly during April and May, coinciding with the earlier flight period of its host. Cherries (Prunus spp. ), Gooseberry (Ribes uva-crispa), Creeping Willow (Salix repens) and Dandelions (Taraxacum spp.). Authors of profile M E Archer and G R Else. In Britain it is a cleptoparasite on Andrena cineraria. The Nomada female detects incomplete host cells which are still open and being provided with food. The Nomada oviposits an egg in the wall of the cell and departs. The host oviposits in the cell when provisioning is completed and seals the cell. The first stage larva of the cleptoparasite has large mandibles which are used to kill the host's egg or young larva, before feeding on the provisions. Keys and general biology are found in Sladen (1912), Free & Butler (1959), Alford (1975) and Prŷs-Jones & Corbet (1991). This species is very closely related to Bombus muscorum but is more southerly in its distribution. B. humilis has undergone a major decline in its distribution, with most remaining populations being on extensive, although sometimes narrow, areas of coastal grasslands. This decline seems to be closely linked to the intensification of farming. Intermittently present along the southern and western coasts of England and Wales, reaching furthest north on the Lleyn Peninsula and Anglesey. There are a few inland populations, most notably on Salisbury Plain, Wiltshire. In common with other bumblebees, relatively large areas of suitable habitat, in the order of ten square kilometres, are required to maintain viable populations. Widespread in Europe, as far north as southern Scandinavia, but declining in many places (von Hagens, 1994; Westrich, 1989). Also found throughout central Asia (Løken, 1973). This species is not listed in either Shirt (1987) or Falk (1991). However, current research shows that this status may be in need of revision. Strongly associated with areas of tall, but open, grasslands supporting a good proportion of perennial plants, especially those in the families Fabaceae, Lamiaceae and Scrophulariaceae. Overwintered queens search for nesting sites during May and early June. Workers fly between June and September; males during August and September. There is a strong preference for pollen from plants from the families Fabaceae, Lamiaceae and Scrophulariaceae. B. humilis queens found nests on the surface of the ground in moderately tall, open grassland. They may well use an old mouse nest as a base. The nest is covered with fragments of dead grass and moss which are gathered, initially by the queen and later by the workers. The species will forage for nectar at a variety of plants, including yellow Asteraceae. Bombus (Psithyrus) campestris has been recorded as a social parasite of this species in mainland Europe (Løken, 1984). A small, rather unobtrusive bee, the female largely black, the male with the clypeus and lower paraocular areas mainly yellow. Found throughout Britain, the range reaching north to the North Ebudes (Skye, Eigg and Rum; also reported in the 19th Century from an unspecified site in Harris) and Orkney (Dounby on Mainland). It is present in Ireland, on the Isle of Man and in the Channel Islands (Alderney). Very local, especially in southern England (where it is quite rare). This species is predominantly found in central and northern Europe and Asia, from Fennoscandia south to Austria, and eastwards to Turkey and Siberia; also known from Japan. Open woodland, moorland, commons, downland, fens and coastal habitats. Univoltine; early June to the end of August. Polylectic, foraging from bramble (Rubus spp. ), harebell (Campanula rotundifolia), hawkbit (Leontodon spp. ), hawk’s-beard (Crepis spp. ), hogweed (Heracleum sphondylium), knapweed (Centaurea spp.) and thistles (Cirsium spp.) (Chambers, 1968). Nests occur solitarily. One found in deep shade in a wood was excavated below loose moss, the clay spoil being built up to form a pipe through the moss (Chambers, 1949). In Ireland, nests have been observed in dry, gravelly flats alongside rivers (Stelfox, 1927). In addition to those listed above, these bees also visit cat’s ear (Hypocaeris radicata), common tormentil (Potentilla erecta), evening primrose (Oenothera spp. ), lesser spearwort (Ranunculus flammula), lesser stitchwort (Stellaria graminea), mallow (Malva spp. ), nipplewort (Lapsana communis), ragwort (Senecio spp.) and wild angelica (Angelica sylvestris). Nomada obtusifrons Nylander is a cleptoparasite of this bee (Perkins, 1919, 1924a, 1924b; Hallett, 1928); perhaps also N. roberjeotiana Panzer (Westrich, 1989). Apparently no stylopized specimens of Andrena coitana have been reported. One of the larger halictine bees of the British Isles, the male has a distinctive blood-red tip to the abdomen. Identification keys and general information are given in Perkins, R C L (1922). Known from southern England and Wales. It is associated with sandy soils, especially if these support heaths (Erica spp.) and heathers (Calluna spp. ), although females are far too long-lived to be oligolectic on these plants. Known from the Channel Islands (Jersey). There are a number of very old (and doubtful) records from the Scottish border region, from where it has not been reported for over a century. Widespread in southern and central Europe: north-western Netherlands and Germany, south to Iberia and Corsica, east to Greece. This species is not regarded as being threatened. However, the current map shows a highly restricted range which suggests its status should be reviewed. Associated with heathy vegetation on sandy soils. Females initiate nests during May, new males and females are produced during August and September. As this is a solitary species, the flight period of females is extraordinarily long. Polylectic, but with a strong preference for heath and heather flowers during the mid and late summer. It has been recorded as collecting pine (Pinus sp.) pollen on Studland Heath. Pollen taken from a British female had been gathered entirely from a plant of the family Caryophyllaceae (G R Else, pers. comm.). A solitary species but may nest in dense aggregations in quite loose, but not continually disturbed, sandy soil which is exposed to the sun. Bell heather (Erica cinerea), cross-leaved heath (Erica tetralix), dandelion (Taraxacum officinale), forget-me-not (Myosotis sp. ), hawk's beard (Crepis sp. ), heather (Calluna vulgaris) and pine (Pinus sp.). It is reported that this species is cleptoparasitised by Sphecodes reticulatus (Morice 1901a) but this requires confirmation. 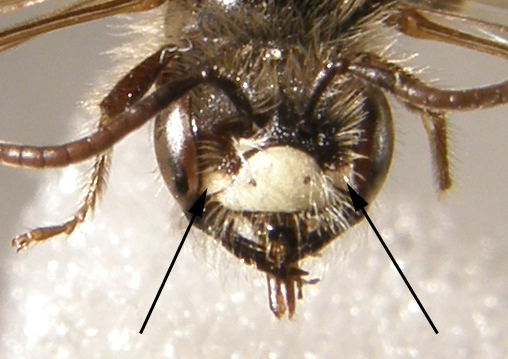 It is possible that Sphecodes pellucidus also attacks this bee (Vegter 1993). This species is commonly listed under the name Nomada xanthosticta (Kirby, 1802) in the British literature (the species name is now treated as a junior synonym of Nomada ferruginata (Linnaeus, 1767)). A rare species, but formerly widely distributed in southern Britain. There were no records between 1949 and 1987. However, in recent years the species has undergone a resurgence, with confirmed records from Hampshire, Kent, Wiltshire, Berkshire, Middlesex, Gloucestershire, Warwickshire, Essex and Suffolk. This is a northern and central European species, becoming more sparsely distributed in the south. Sites include open deciduous woodland, the coast (as at Dungeness, east Kent) and open sites where the host species occurs. Univoltine; mid April (exceptionally March) to mid May. A cleptoparasite of the mining bee Andrena praecox (Perkins 1919; Chambers 1949; Westrich 1989). It is only found with a small number of populations of this host species. Chambers (1949) also lists Andrena varians as a possible host. Lesser celandine (Ranunculus ficaria), black currant (Ribes nigrum), sallow (Salix sp.) and dandelion (Taraxacum sp.). Andrena distincta Smith, 1847 (nec. Lucas, 1849, nec Schenck, 1861); Andrena obscurata Smith, 1853. Very rarely encountered and confined to scattered sites in southern England. Females are often locally abundant if a nest has been located. The apparent rarity of this species may be partly explained by the habits of both sexes. Females have very localised nest sites and, on leaving, they seem to fly high up to forage in the canopy of oaks (the flowering period of this tree is also very short). Males too visit the flowers of trees and shrubs for nectar. The species is similarly rare on the continent (e.g. Westrich, 1989), with records from The Netherlands, Belgium, France, Spain, Germany, Switzerland, northern Italy, the Czech Republic, Bosnia, Crimea and the Carpathian Basin (see Leys, 1978). Classified as Endangered (RDB1) in the Red Data Book (Shirt, 1987) and by Falk (1991). Mainly known from open, deciduous woodland. In eastern Europe, males have been reported as flying around oaks and copulating with females on the leaves, often at a height of 4-5 metres (Kocourek, 1966). With a sudden change of weather both sexes shelter under the flowers of shrubs, mainly hawthorn (Crataegus monogyna), where they may also spend the night (Kocourek, 1966). Univoltine; late April to early June. Pollen analysis from females collected in the New Forest, South Hampshire, indicated that they had foraged exclusively from oak (Quercus robur) blossom (S P M Roberts and P Westrich, pers. comm.). Also, from pollen analysis, females were found to only visit oak blossom in The Netherlands (Leys, 1978). In Germany, the bee is reported to be polylectic, foraging from sycamore (Acer pseudoplatanus), oak (Quercus spp.) and hawthorn (Crataegus monogyna) (Westrich, 1989). This species nests communally in burrows excavated in the soil, many females sharing a common nest entrance. In The Netherlands, each communal nest may be inhabited by up to 80 females. Investigations in a meadow in the same country revealed an aggregation of about 200 such nests. It was estimated that the total female population in this site was about 15,000 (Leys, 1978). Hawthorn, oak and sycamore. Also a white-flowered crucifer, possibly a species of mustard (G W Allen, pers. comm.). In Britain, the cleptoparasitic bees Nomada flava Panzer and N. marshamella (Kirby) have been seen flying around the nest burrows of this Andrena (G R Else and S P M Roberts, pers. obs. ; Yarrow & Guichard, 1941, respectively), the former species entering a nest burrow.